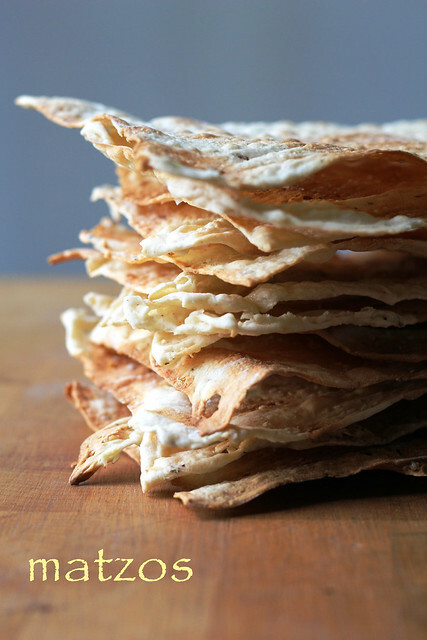 The Matzo recipe from Lauren Groveman is bread at its most basic. Really, it’s just flour, salt and water, hand-kneaded and with no real resting period required. A little ground pepper and some sesame seeds are technically optional, but I wouldn’t skip them…they make a boring-sounding dough interesting and flavorful. The instructions say to roll the dough as thin as possible. When I make crackers, I like to roll them out on my pasta machine rather than with a wooden pin. I did that here, too, and because the machine cranks out long, narrow, strips, I wound up cutting them into smaller pieces than the large, plate-sized matzos shown in the book’s photos. The smaller pieces seemed also more easy to deal with using the kinda scary-sounding baking-and-flipping-on-a-blazing-hot-sheet-tray technique called for in the recipe. I only burned myself once, so I’d call that a success! I got matzos that were much more thin and delicate than the store-bought ones I’ve had. And did I already mention how good the sesame seeds are in here? I made a little smoked salmon, dill and cream cheese spread to go with the matzos, and the combo was every bit as addictive as chips and dip. For the recipe, see Baking with Julia by Dorie Greenspan (there’s also a video of the episode). Don’t forget to check out the rest of the TWD Blogroll. I’m no interior designer. This has been made painfully obvious to me by my home decorating choices (more accurately called mistakes). Right now I’m trying to choose a few paint colors and I just can’t. I can’t. I need a glass of wine and a treat. 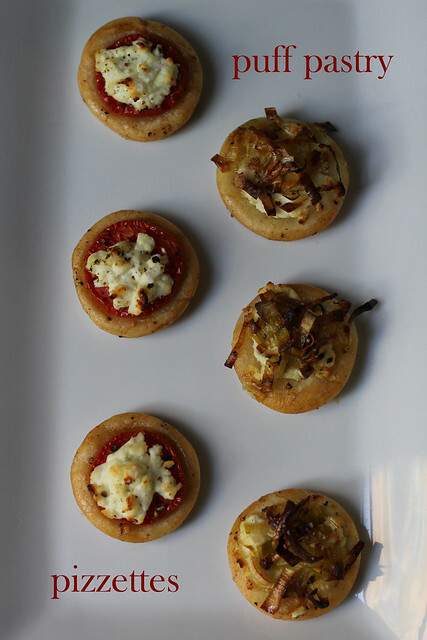 Thankfully, that I can do, and easily, too, with Michel Richard’s Puff Pastry Pizzettes. 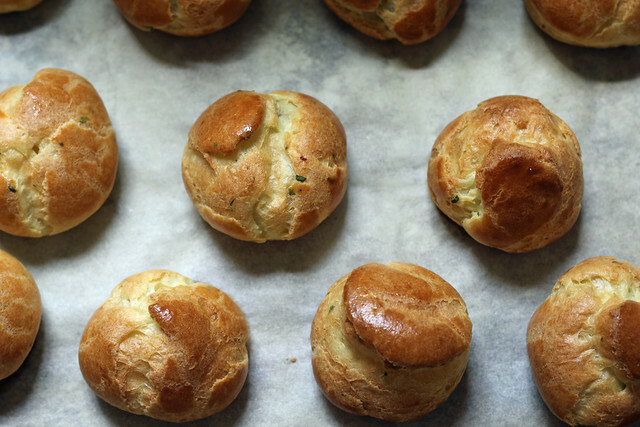 These little one bite snacky hors d’oeuvres are meant to use up the scraps from the other week’s Sunny-Side Up Apricot Pastries. Homemade puff pastry (heck, even store-bought– it’s expensive!) is a no-waste situation. I only made two of the apricot pastries so I really didn’t have a whole lot of scrap to go with here and just got six pizzettes. 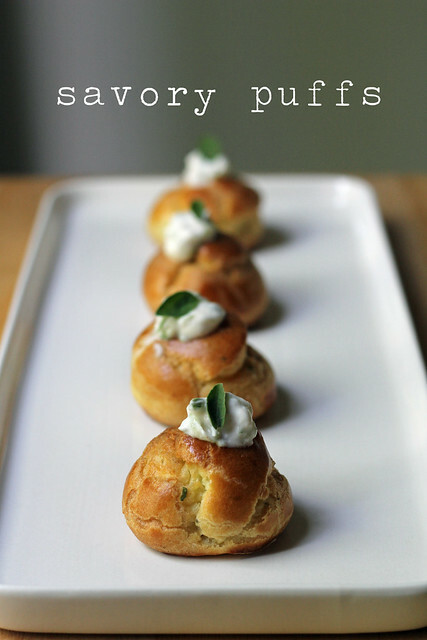 Even so, I made two versions with goat cheese– one with tomato and the other with sautéed leeks. I’m annoyed that I forgot to put a little parsley leaf on top of each tomato one…my picture would have been cuter! See what I mean? I fail on the design details. These were a tasty little snack with glass (or two) of wine. They were best warm, though. The room temp one I tried had definitely lost some of its crispiness. 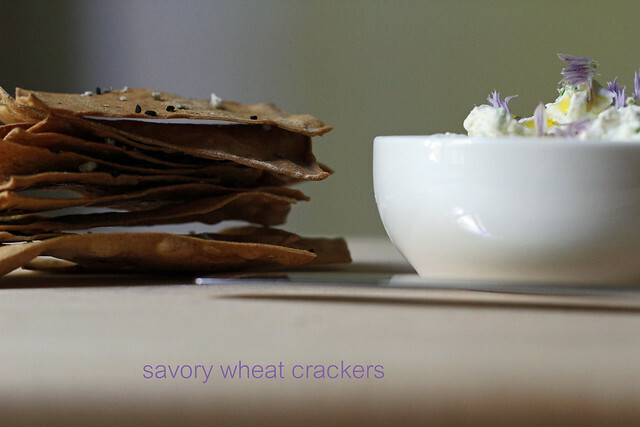 Jeffrey Alford and Naomi Duguid’s Savory Wheat Crackers were a nice little snack to munch on with a chilled glass of wine this past (very fine) weekend. I’ve made crackers before…here, for instance. Also, in the restaurants I’ve worked in, pastry always had to make the crackers to go with the cheese plates. Rolling cracker dough out with a pasta machine (or a sheeter like we had at my first job) is my pro tip from those days. It gets them super thin, although you have to use a fair amount of flour to not shred the dough in the roller. I took these to the second thinnest setting in my machine and then topped my crisps with nigella seeds, ground coriander and fleur de sel. This whole wheat cracker dough is super basic….no leavening necessary. It comes together with a whiz in the food processor, although my dough was a little sticky, so I added some supplemental AP flour to make it behave. The recipe makes a lot of dough…even the half recipe I made yielded tray after tray of crackers! They have to be rolled, cut and baked in batches. It was like a Nabisco factory in my kitchen on Sunday. Actually, I forgot to cut two of the trays before I put them in the oven– I just broke those into big shards after they were cool. Real Nabisco would so fire me. You need a ripping hot oven for these and will likely have to tack on a few minutes to the stated baking time. My crackers took 6-7 minutes to bake through, rather than the three minutes in the recipe. One minute too many, though, and the crackers will be charcoal (and yes, I did torch a tray myself)! I made a little spread out of famer’s cheese and flowering chives to snack on with these crackers. I have lots more to eat up, so I’ll have to think up some other ideas. For the cracker recipe, see Baking with Julia by Dorie Greenspan. Don’t forget to check out the rest of the TWD Blogroll! This month we had our first “Alternative” Daring Bakers’ Challenge! Natalie from Gluten A Go Go and Shel of Musings From the Fishbowl teamed up to bring us a two-part challenge. The first part involved making homemade lavash. 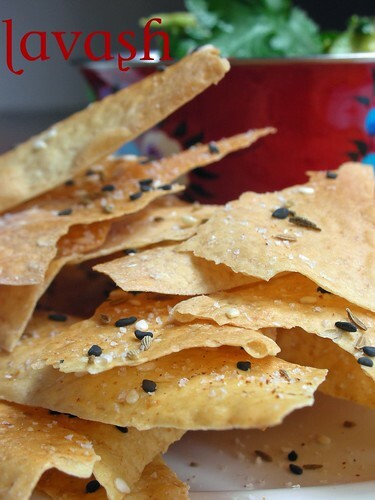 Lavash are thin Armenian-style crackers. They are very popular here in Australia, and packets go for big bucks in the gourmet stores. Funny how easy it is to make them yourself! Lavash are great with cheese, but the second part of this challenge was to concoct a vegan and gluten-free spread or dip to go with them. Lavash dough is a simple yeasted dough, rolled out thin and often sprinkled with a seedy topping. We were allowed to flavor the dough itself if we so desired, so I subbed a couple of tablespoons of the bread flour for wheat germ. This gave the baked crackers a subtle, almost Wheat Thins-like flavor. I made a full batch of the dough and divided it into two pieces–one to use straight away, and one to park overnight in the fridge. I used different toppings and made a different spread for each. When it came time to roll the dough, I busted out my pasta machine (for the first time since moving to Sydney, so I was glad to actually have used it and justified its move). I’ve made some form of cracker in every restaurant I’ve worked in, and have always used a pasta machine to roll them out. It makes such quick work of it and is the easiest, least frustrating way to get your crakcers paper thin. Use the lasagna sheet section, work with one bit of dough at a time, and take it down to the thinnest setting. For my first batch of cracker, I rolled out long, wide pieces that I sprinkled with black and white sesame seeds, cumin seeds, cayenne pepper and Kosher salt before baking (brushing on a little water first acts as glue for the topping). I simply broke these big pieces into more manageable shards after baking. 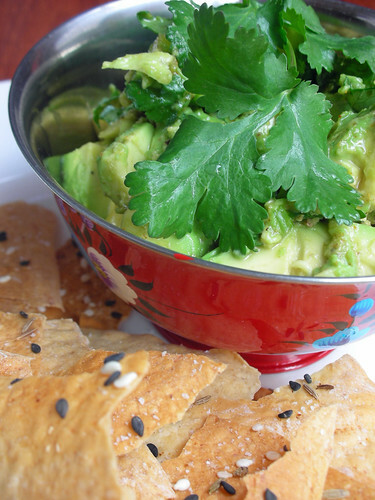 I served them with a chunky avocado relish with heaps of cilantro, lemon juice and spices. For my second batch of cracker, I got a bit more fussy. Instead of just baking off big pieces in whatever form they took when rolled, I used a pastry wheel to cut them into rectangular crackers. 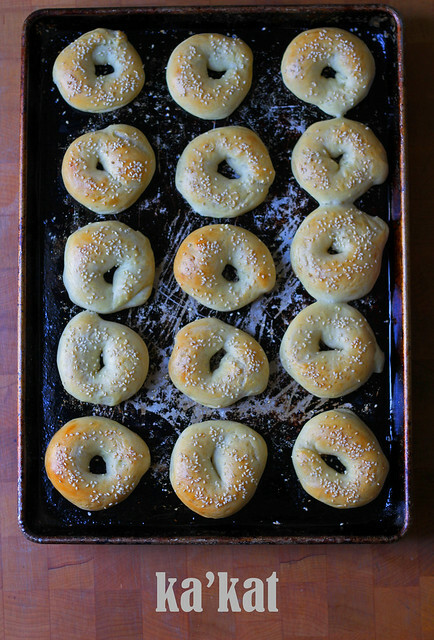 I sprinkled them with poppy seeds and Maldon salt. I had a huge bag of fava beans (a.k.a broad beans) from the farmers’ market, so I took about half of them and whizzed them into a dip for this batch of lavash. I was really pleased with challenge! 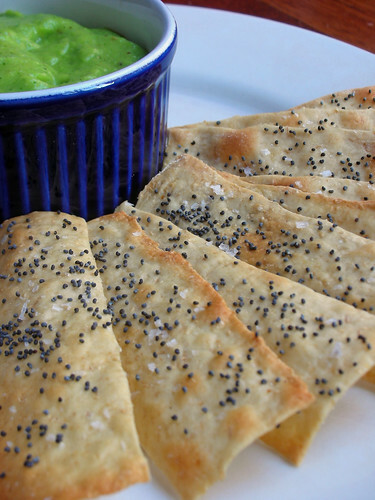 The lavash and dips made perfect pre-dinner snacks (with a glass of wine, not too shabby!). And how impressed would your friends be if you served them homemade crackers at a dinner party? Check out the DB blogroll! 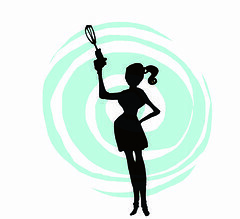 And visit Gluten A Go Go or Musings From the Fishbowl for the lavash recipe (which was adapted from The Bread Baker’s Apprentice: Mastering The Art of Extraordinary Bread by Peter Reinhart). I made my two spreads pretty much freehand, but the basic procedures are below. -Scoop out the avocado and dice into chunks. Chop your herb. In a small bowl, make a dressing from the lemon juice, a slight splash of oil, the spices and salt and pepper. Add the avocado and herb to the bowl and toss gently to mix. -Bring a medium pot of water to the boil. Blanch the fava beans for about thirty seconds, remove with a slotted spoon and shock in ice water. Pop the garlic clove, peeled or unpeeled, into the boiling water and blanch for about 1 minute (this just helps take the edge off the raw garlic). -Pop the papery outer skins off the blanched fava beans and discard. Peel the garlic clove if you haven’t already, and rough chop. -Put the fava beans, garlic, lemon juice, herbs, splash of olive oil, salt and pepper into a mini food processor. Pulse until it’s the consistency you like (you can use a couple tablespoons of water to thin out, if needed). Taste for seasoning.